This is another one of the tiger beetles I brought back alive from the Sandhills of western Nebraska since I was unable to get any good photographs of this species in the field. If this photo looks familiar, you may recall this headshot of another individual, representing the eastern subspecies (Cicindela formosa generosa), that I took back in September in southeast Missouri. Compare the two photos to see the distinctly reddish dorsal coloration of nominotypical C. formosa versus the darkened coloration of C. formosa generosa. Nominotypical C. formosa also has a much more violaceous ventral coloration. If this guy looks a little angry, it’s because he is! I had prodded and poked him for some time by the time this photo was taken, trying to coax/force him away from the edge of terrarium in which I had him confined. Every time I thought I had him sitting still in a good position, he would run suddenly and make a beeline to the edge – a most unphotogenic place. He even reached up a few times, seemingly out of shear frustration, and bit at my finger while I tried to push him back away from the terrarium wall (talk about biting the hand that feeds you!). Finally I got him sitting still in the middle of the terrarium – his half-cocked mandibles suggesting exhaustion or rage, or maybe both. Like the Cicindela limbata individual from the same locality that I brought back alive for photographs, this little beast lived for 10 weeks in his terrarium before, ahem… donating his body to science. Also like C. limbata, he amusingly reached up and grabbed caterpillars directly from the forceps almost every time one was offered. I think my colleagues in the lab enjoyed feeding time as much as the tiger beetle! This entry was posted in Cicindelidae, Coleoptera and tagged beetles, entomology, insects, nature, Nebraska, science, tiger beetles. Bookmark the permalink. 11 Responses to You messin’ with me? WOW!! This is a vicious looking critter Ted almost as bad as my Monster Tiger Beetle (Manticora). This one was HUGE. One of the biggest beetes I have seen and he would gladly have taken my finger off too. 🙂 I was away on leave at the time and the only thing I had to restrain him was a large plastic bag into which I managed to scoop him. Even though I was in South Africa to collect buprestids, I was really hoping to run into a Manticora tiger beetle or two. No such luck – sigh! They are handsome beasts. New page looks great. I, too, moved from blogspot to wordpress, but also transferred to my own domain along the way. It was worth. Everything looks really great. I’ve updated my blogroll, too. And great photo, by the way. It is the first time I have come across one of these Ted so don’t feel bad about not finding one on a short visit. This one was in Pilansberg which is next to Sun City about 80 miles west of Pretoria. A fantastic shot, Ted — well worth risking your finger to get, I’d say. Moe and Marvin — thanks! Joan — you might be surprised at the interest out there among lurkers. Besides, there’s no harm in sayng, “possibly a sp. in the genus Whatever.” That’ll bring in traffic from potential experts or knowledgeable amateurs doing Google searches (and who are much more likely to Google scientific than common names). I never thought of it in that manner Ted and you are correct about it. I will start doing it more from now on. Thanks again. 🙂 BTW I saw your helpful species names on the other blogs of mine. Thank you for them, it is extremely helpful. Absolutely great shot. I would hate to have that running after me. Another shot that has me totally envious. They have never had much success in actually biting me (in contrast to some of the other Coleoptera). Could you feel it when it bit into you? Thanks, cedrorum and Doug! It’s easier to get these shots when you have the beetle confined – just take a bunch of shots and one’ll work! 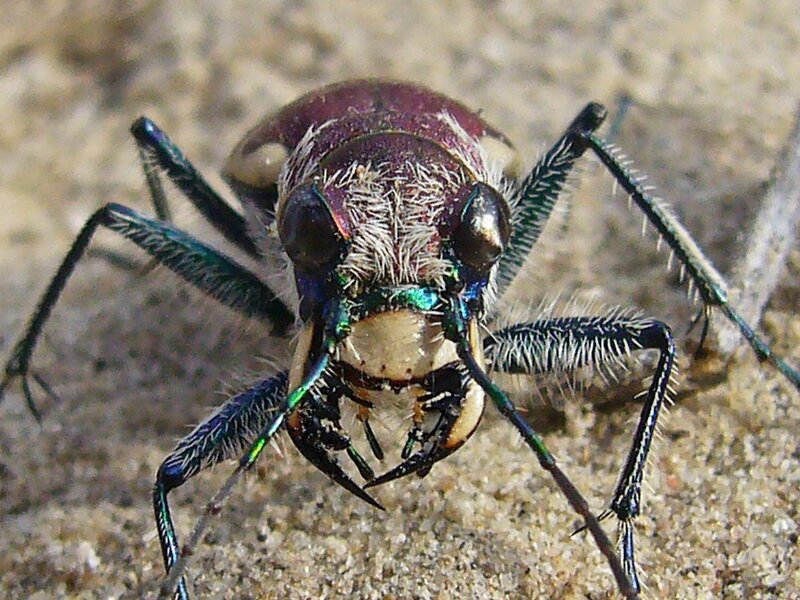 It bit my finger a lot, but even the biggest Cicindela species aren’t big enough to do any damage. I wouldn’t have been so brave with an Amblycheila!